The question is: “How long will I live?” The answer is: No one knows how long you are going to live. However long it is, it will not be long enough. Many factors determine when death occurs including genetics, cardiovascular disease, irresponsible behavior, accidents, and environment. It is a fact that even anti-aging efforts cannot put off the inevitable forever. However, the best determination of your expected time of departing this life is the actuarial life tables tabulated by life insurance companies. Insurance companies are big data collectors in regards to your current age, your present health, and your medical conditions. If you are female and have reached the magic age of 70 without significant medical disease, you have a 70% probability that you will survive at least to the age of 90. Men are not as fortunate as ladies. If a man reaches the age of 70 without experiencing any significant diseases, his probability of survival to the age of 81 is 70%. These survival numbers are key to life insurance companies profitability. In a world of statistical probability, insurance companies are among the best in determining the final results. Estimates by life insurance companies are for a pool of individuals but not for a specific person. Actuaries are excellent in predicting the probabilities, but can not tell who will be affected. The time of death for any individual will remain an unknown. What May Shorten Your Life? The easy answer to the length of life is determined by genetics and life choices. If your parents lived to 90 years old, your probability of a long life is much better than having parents who only lived to be 50 or 60 years old. If you have a genetic condition such as cystic fibrosis, sickle cell disease, adult polycystic kidney disease, Huntington’s chorea, or numerous other diseases, the answer to the question of “How long will I live?” is not as long as if you did not have the disease. Acquired conditions, such as coronary artery disease, diabetes, and renal failure are also associated with a shorter life expectancy. Irresponsible life choices such as illicit drug use, alcohol, and risky activities are associated with shortened life expectancies. What Can I Do To Live Longer? 1. Choose your parents well. Ha ha. You have no choice in this matter. 2. Exercise is the single best age delaying activity. When exercising, you should include both aerobic exercise (walking, running, cycling, swimming, dancing, etc) and resistive exercise (weight training). Exercise increases strength, stamina, and blood flow to the body and brain as well as increasing growth hormone production and endorphin production. Endorphins are chemicals released in our brains similar to morphine. They produce a euphoria, a sense of well being, as well as relief from pain. Along with mentally stimulating activities for your brain, exercise is one of the most helpful ways to delay dementia. 3. Mental brain games such as Sudoku, chess, card games, reaction times games, video games, reading, and crossword puzzles will help delay mental deterioration. 4. Sunlight is a key to mental stability and preservation. In addition to producing Vitamin D in your skin, sunlight stimulates your brain. As little as 15 minutes per day is enough to stimulate your brain to “wake up”. Staying indoors constantly will lead to mental depression as well as will dull your senses. 5. Social interaction with family members and/or work associates is very important for brain stimulation. Social isolation leads to limited brain use which leads to depression. 6. Diet is as important to brain health as any of the above suggestions. Diet is particularly critical for older adults. They tend to eat the same dishes every day rather than a rich and varied diet. A poor diet leads to a deficiency of vital nutrients, vitamins, adequate protein, calcium, and electrolytes. 7. Dietary supplements are needed to ensure adequate intake of essential and non-essential vitamins and minerals. Some of these essential supplements include vitamin C, vitamin D, B vitamins, beta-carotene, and magnesium. Nonessential helpful supplements include lutein and brain stimulants such as caffeine or gingko, fish oil, red rice yeast, ashwagandha, and turmeric to name a few. 8. You should have a family physician to monitor your health and treat your medical conditions. Nothing is worse for in-hospital physicians than a sick person with no prior medical care, no documented history of prior illnesses, of prior surgeries or of present medications. Help yourself as well as your future medical care and be followed by a medical professional. He or she can help you in your goal to control your blood sugar, blood pressure, and body weight. 9. Avoid stress. Stress is a silent killer, just like unrecognized high blood pressure. Consider meditation, yoga, or removing the “big” problems in your life. Antidepressant medications are greatly overused and may worsen your mental state. 10. When possible, take vacations away from your present location. Nothing resets your life better than vacations away from stress and irritating people. These suggestions are just a few to help you improve your life, and hopefully, make it possible to live a longer and healthier lifespan. The longevity of your life is something no one can answer. However, with anti-aging education and a dedicated determination to do the best we can for our bodies and our minds, we can increase our chances for a long and fruitful life. 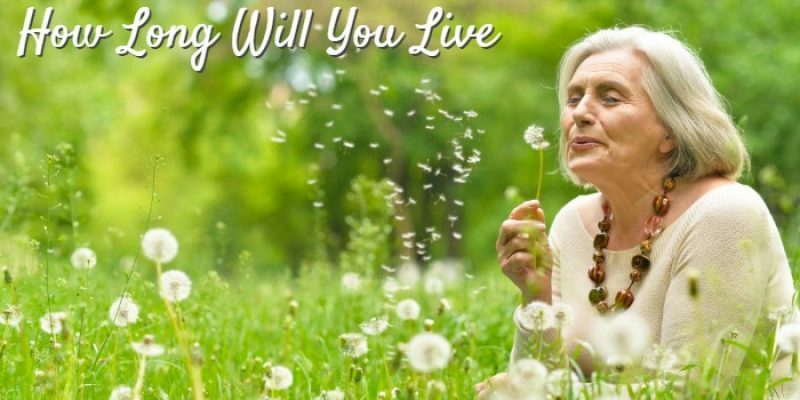 The answer to your question “How long will I live?” can not be answered for you individually. However, only you can improve your odds. Read more about anti-aging at the GuideForSeniors.com. Dr. Long has been practicing medicine since 1981. He is avid about keeping up with current medical practices. He completed his medical degree at the Medical College of Georgia in Augusta, Georgia. He continued his studies in Savannah, Georgia, and Augusta, Georgia. He is knowledgeable about all aspects of anti-aging, staying healthy and avoiding disease.